Published: Sept. 25, 2016 at 10:38 p.m. Updated: Sept. 27, 2016 at 03:37 p.m. Opportunity is the name of the game in fantasy football. Talent matters, of course, but we want players who see a healthy volume of targets and touches to anchor our lineups, especially in daily fantasy. Every week in the second season of the Opportunity Report, we'll look at all the passing targets for every NFL team and the percentage each player owns. Franchise will handle the backfield touches section this year and his Week 3 piece is tabbed above. After Week 3 we have even more new data to work with and can dig into the passing distribution for each NFL team. We're trending far more towards the territory where we need to believe what we are seeing in these distributions is the new reality we should adopt. After two disconcerting weeks of poor usage and single-digit catch outings, this was a sign of optimism for John Brown. He played 57 percent of the snaps, well ahead of Jaron Brown and tied Michael Floyd for second on the team in targets behind Larry Fitzgerald. He hauled in six of his 11 targets for 70 yards and finally looked like the John Brown of old. Brown's usage should continue to trend upward as he gets further away from the dreadful offseason concussions which cost him "way too much time" according to coach Bruce Arians. The Cardinals need better play from their wide receiver group as Michael Floyd continues to be one of the more disappointing players in the early going of this season. Floyd had the Bills' cornerbacks in his hip pocket consistently on Sunday. With the ground game dominating, the passing attack merely needed to be a complimentary asset in Week 3. Nevertheless, this was the third week in a row where Julio Jones' volume was a concern as a he came in under nine targets once again. Jones may not be healthy, but at this point, we have to at least wonder if the constant incorporation of both running backs will take a bit off his ceiling all year. Steve Smith continues to look more comfortable each and every week. He still played on only 60 percent of the snaps, but clearly owned the team lead in targets. His average depth of target was just 5.6 on Sunday and only 7.5 for the season. That indicates he is clearly Joe Flacco's security blanket, and there's plenty of value in that for a team that is 10th in the NFL in pass attempts heading into Monday Night Football. Through two weeks it has become apparent that Smith and Dennis Pitta are the top-two targets in this passing game. No Bills pass-catcher is relevant with Sammy Watkins out. Robert Woods had a 32 percent share of the team targets despite seeing just eight go his way. We will have to wait until Sammy Watkins plays to see if new offensive coordinator Anthony Lynn really does change the passing game at all. Munnerlyn revealed that the Vikings planned to do everything in their power to keep Benjamin contained, while they were not particularly worried about the other threats (especially Devin Funchess, it seems). Expect this to be the outlier game in terms of Benjamin's usage and production. The expectation was that Brian Hoyer would start and lock-in on Alshon Jeffery. Instead, that honor seemed to go to Kevin White. The second-year player saw more targets in this game than he did in his first two games combined. While those watching the game on Twitter seemed quite impressed, and White did haul in a nice one-handed reception, he still made mistakes and didn't look like the dominant force he was in college. It didn't help matters that several of those 14 targets weren't catchable in the slightest. This is going to be a slow burn for White's progress this year, but it was nice to see Hoyer make use of the talented young player. A.J. Green once again owned a dominant share of the team targets, checking in a 39.3 percent. His volume gives him a tremendous floor to count on in the vast majority of weeks. However, the lack of periphery options looks to be rearing its ugly head. No other Bengals pass-catcher cracked 40 receiving yards in this matchup. Cincinnati should get Tyler Eifert back soon, which will help alleviate some of the pressure. Terrelle Pryor was absolutely dynamic on Sunday. Not only did he dominate the target share for Cleveland on a 36.8 percent clip while racking up 144 yards, he also ran four times for 21 yards and a touchdown and threw the ball five times, completing three for another 35 yards. The Dolphins defense isn't exactly the toughest test, but Pryor looked like the actualization of the long overused term "offensive weapon." Yet, the best news of all was that Pryor ran routes like a wide receiver and made a number of clean consistent catches. The volume Pryor saw in this contest won't last much longer with Josh Gordon set to return in Week 5 and Corey Coleman still on track to return at some point. However, he's made a legitimate leap to the level of a starting NFL wide receiver and should be owned across all fantasy leagues. We have to wonder if the Browns continue using him as a runner and quarterback with Cody Kessler the starting signal-caller. After seeing 14 targets in Week 1, Jason Witten has just six in the last two games. The offense flows through Dez Bryant, who missed some plays with a knee injury in this game, and Cole Beasley. We should no longer be waiting to write off Beasley. It's clear that Dak Prescott values him as a safety blanket. We should expect him to continue to see targets the rest of the way. Denver asked Trevor Siemian to go downfield in this game far more often than they did in the first two weeks. Siemian registered an 8.6 average depth of aimed throw in Week 3 after checking in with a 6.6 average in his first two starts. The Bengals dared the Broncos passing game to beat them, and the quarterback responded. Obviously this is what we were hoping for with the Broncos receivers. Their volume of targets gave each a secure floor at the position and improved more aggressive play under center helped them access their ceiling. Going forward, it will come down to whether the matchup will dictate the offense opening up. Week 4's faceoff with the Buccaneers, who bring a strong front-seven and weaker secondary to the table, looks like another one of those spots. For all intents and purposes, Marvin Jones and Eric Ebron are the top two receivers in this offense, as they are the only two working downfield. Jones added a 200-yards and multiple score game to his growing breakout season resume. Golden Tate, meanwhile, averages 7.2 yards per reception this year and has yet to haul in a deep target. He's far closer to Theo Riddick in terms of usage than he is to Jones. Jordy Nelson has led the Packers in targets each of the last three weeks, but Sunday was his first true return to prominence. Nelson caught 85.7 percent of the targets that went his way and owned a near-30 percent share of the team targets. His average depth of target (11.7) leveled out a balanced number after checking in at a lowly 5.3 in Week 1 and a deeper 13.7 in Week 2. It's safe to say Nelson is all the way back. The Pro Bowler's return to form did not create a rising tide for Randall Cobb and others' stats. However, let's remember that the Packers jumped out to a 31-10 lead in the first half, and as is Mike McCarthy's tendency, they went into a shell in the second half to try and hold the lead. In more competitive games, there's still reason to hold out hope for Cobb. It's hard to take much from this game for the Texans, as the team fell behind quickly and was eventually shut out. It's far more pivotal to weigh the first two games of the season where the Texans funneled their offense almost exclusively through DeAndre Hopkins and Will Fuller. With Brock Osweiler under a ton of pressure, he was simply content to dump the ball off to Ryan Griffin frequently throughout the game. With Donte Moncrief out the Colts dialed back their three wide receiver sets (25 plays) and increased their use of two tight end groupings (30 plays). Phillip Dorsett's snap share checked in at 89 percent, which was barely up from his 84 percent in Week 2, and well behind Moncrief's 97 percent in Week 1. On the other hand, Jack Doyle's snap share continued its upward trend from 56 percent in Week 1, to 62 percent last week and culminating in 75 percent this week. For at least while Moncrief is on the shelf, Doyle remains a major cog in this offense. The needless panic on Allen Robinson can subside now. He's led the team in targets in two of his three games this far this season, but was shut down by Jason Verrett in Week 2. On Sunday, Robinson saw three red zone targets (tops on the team) and caught three of them for 20 yards and two touchdowns. It's his role as the lead dog inside the 20-yard line that unlocks his ceiling. He should continue to get more work in the red area as Jacksonville's schedule lightens up with dates against the Colts, Bears, Raiders and Titans coming up. We should expect the duo of Jeremy Maclin and Travis Kelce to maintain the team lead in targets on a week-to-week basis. Both players garnered seven targets but Kelce turned his into more production. Maclin had another drop on the day, his third in the first three weeks, per Pro Football Focus. Week 3 was the first time the Chiefs were able to win a game playing on their preferred script of leaning on their defense. While the Kansas City defense is not what it once was, these games of low volume in the passing attack will happen. The player most affected in this game was Spencer Ware, who came into Week 3 leading the team in receiving yards, but garnered just one target in this spot. Both Tavon Austin and Brian Quick were able to get behind a putrid Buccaneers secondary for long touchdowns. Before we get fooled by Quick again, remember that he played on just 55 percent of the snaps on Sunday. Kenny Britt looked like he was developing something of a floor in this offense after seeing 34.5 percent of the team targets in Week 2. That game crashing down to earth in a plus matchup this week. DeVante Parker started off this game with a bang, catching the first touchdown of the contest. However, he went silent quickly despite the game remaining competitive. He finished third on the team in wide receiver snaps and targets, which should remind us that there will be some volatility in his weekly stat lines. Nevertheless, Parker is developing nicely after a poor offseason. With or without his own numbers, Parker's mere presence on the field is what matters most to the Dolphins offense. After today Jarvis Landry now averages 11.9 targets and 105.6 yards in games he plays with Parker, compared to 6.1 and 59.4 in games without Parker the last two years. The threat of another option beyond a slot receiver in Miami's offense opens up opportunities for the unit as a whole to improve. For the first time this season Stefon Diggs did not lead the Vikings in all relevant receiving categories. This was not, however, some sort of exposed moment for the second-year wideout. He still ran routes and made plays with his chances. Fantasy players should always remember that special teams or defensive return touchdowns are always going to hinder the output of a team's skill position player, as it wipes out an entire possession for the offense to accrue production. Kyle Rudolph has target totals of eight, eight and 10 the last three weeks and touchdowns in back-to-back games. He's a big part of a passing game that will naturally need to pump more volume into the game plan with Adrian Peterson no longer around. There was not much volume to go around for the Patriots pass catchers as the team threw for well under 200 yards with Jacoby Brissett under center. Rob Gronkowski's return to play was disappointing as he primarily blocked and was a no-show in the stat sheet. We'll be completely hands off this passing game if Brissett must start the fourth and final game sans Tom Brady. With Willie Snead out, Michael Thomas took over his volume and performed quite well with it. Despite a quiet first two weeks, Thomas should be an end-of-bench stash in fantasy. He's a talented player and a good fit in this offense. Coby Fleener finally emerged after whiffing in two plus-matchups the first two games of the season. The Falcons also don't pose much of a threat to opposing tight ends. Fleener will have big weeks, there's just too much volume in this offense, but we have a clear picture of how difficult to predict they will be. You also should have known you signed up for some volatility with Brandin Cooks. 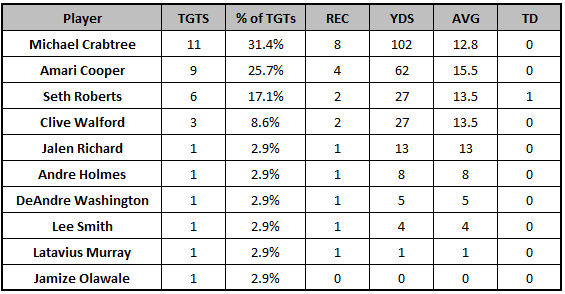 Desmond Trufant, who does not always shadow top wideouts, shut him down in coverage per Next Gen Stats. Cooks squared off with Trufant on 29 pass plays (out of 54), and totaled five targets, one catch, nine yards and Brees earned a mere 39.6 passer rating throwing to him. As Marcas Grant says, Tommylee Lewis reminds us that you're playing wide receiver roulette in the Saints offense. Cooks has another tough cornerback matchup in Jason Verrett when the Saints travel to San Diego in Week 4. The Giants deployed three wide receivers on all but two of their plays where they used four wideouts. Odell Beckham played 100 percent of the snaps, while Sterling Shepard and Victor Cruz played 99 percent. At this point Shepard is ahead of Cruz in the pecking order, and we could see that coming by the team asking Cruz to move out of the slot to make room for the rookie. Shepard had more targets than the veteran for the second straight week and came with a lower average depth of target (11.1 to 13.7) indicating he will bring more consistent production going forward. 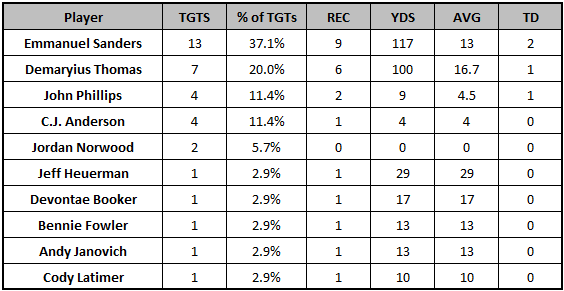 Nevertheless, all of these wide receivers will be relevant on a week-to-week basis. Odell Beckham passed his Josh Norman coverage test with flying colors. Per Next Gen Stats, Beckham lined up opposite Norman on 28 pass plays getting 10 targets, 6 catches and 107 yards with Eli Manning earning 96.6 passer rating. Even though he has not reached the end zone yet, any worries about Beckham's stock should be put to rest. Just take this game and throw it in the garbage. The passing distribution looked roughly the same as it always does, but Ryan Fitzpatrick was frightfully inefficient in throwing six interceptions and averaging under five yards per attempt. There isn't much to learn from this box score. Not much change to the Raiders passing distribution here. Michael Crabtree led the team in targets after Amari Cooper did so in the first two weeks. Those two will alternate that role on a week-to-week basis. Cooper has still yet to catch a pass in the red zone through three games, and only has two targets there. Seth Roberts leads the team in targets inside the 20-yard line and has two touchdowns. Clearly valued by the organization and trusted by Derek Carr, Roberts would be in for a big opportunity if Crabtree of Cooper were ever to miss time. In 34-3 blowout win, the Eagles did not need to pass the ball much, and Darren Sproles leading the team in targets shows that. The snap share among the wide receivers remained the same with Jordan Matthews leading the way (85 percent), Nelson Agholor is second (80 percent) and Dorial Green-Beckham rounding out in third with (49 percent). For the first time this season, it appeared the Steelers finally felt the absence of Martavis Bryant. Sammie Coates is only a big play threat, and doesn't operate outside of 40 yards down the field, Eli Rogers left the game with an injury and Markus Wheaton was painfully ineffective, as per usual. Antonio Brown continues to produce regardless of what's around him, and his target share should eclipse 30 percent every week with the state of their pass-catchers. The Steelers need someone else to step up and assist him if they want to remain one of the NFL's deadliest offenses. Dontrelle Inman continues to lead the team in wide receiver snap share, but this is clearly all Travis Benjamin and Tyrell Williams' show. Williams led the team in targets today and actually played more snaps than Benjamin. Williams also looks like he's usurped the top red zone role on the team, as he is third in the NFL with six red zone targets through three games. Benjamin remains a player with an excellent six-to-seven target floor. This was not the matchup where any 49ers pass-catcher was going to have a good game. The team needs to start thinking about a change under center soon, because this simply cannot go on much longer. Jimmy Graham's resurrection begins. His snap share rose the previous two games with 21 percent in Week 1 and 82 percent in Week 2, before culminating in a 68 percent share in a blowout win of the 49ers in Week 3. Graham's health is incredible to see after devastating injury, and we should expect him to remain a big part of this offense. However, don't be so quick to forget how Seattle struggled to incorporate him into the game plan on a consistent basis last year. Either way, there's no question Graham is a true difference-maker for this team. Now for the bad news: Graham's re-emergence likely puts to rest any hope that Tyler Lockett emerges as a top-30 fantasy receiver this season. Lockett played on just 33 percent of the snaps but was wearing a brace throughout the game. Lockett's injury issues are keeping him from establishing a clear role in a passing game with a banged-up quarterback and now he'll compete with the ultra-talented tight end for targets behind Doug Baldwin. He's so good at football that things could change at any minute, but for now, the outlook is cloudy. The situation is vastly different from where things sat earlier in the offseason, and while Lockett is a tremendous talent, he should now be regarded as a non-essential end of bench stash until something changes. Mike Evans is now second in the NFL (heading into Monday night) in targets with 38 behind Antonio Brown's 40. He also matched his clear outlier 2015 touchdown total with his third score in as many weeks. Evans is the target hog of this offense and on his way to becoming one of the NFL's best receivers. Conversely, Vincent Jackson has nine catches on 22 targets this year, which is second on the team to Adam Humphries. It's been one hell of a career for Jackson, but this looks like we are past the end of the road. Cameron Brate played on 76 percent of the team snaps, well ahead of Brandon Myers' 46 percent. He also led the team on Sunday with a whopping five red zone targets, catching two for touchdowns. Brate now looks like a strong candidate for a breakout season at tight end with Austin Seferian-Jenkins' departure clearing the way. It might be time to just "let it go" with all non-Delanie Walker Titans pass-catchers. The team does not push the ball down regularly or effectively. Marcus Mariota is not playing well enough to elevate this group, either. Jamison Crowder comes up in this space seemingly every week and he tied for second on the team in targets with three other players in Week 3. As usual, Crowder was only targeted at an average of 5.8 yards down the field. However, he showed off more big play ability, racking up 23.3 yards after the catch. At this point, it's time to consider Crowder one of the top-three receiving options, at worst, on this team. Considering Washington skews pass-heavy, that makes him a weekly flex consideration. Crowder's emergence, especially as a surprising red zone weapon, has come at the expense of Jordan Reed. He no longer owns a dominant share of the team passing targets and doesn't hold the same touchdown upside as he did down the stretch in 2015.